Poetry and love go together and this being the month of love makes it a good time to share a poem by Professor Oliver Friggieri which he wrote at my request a few months ago after a discussion on the use of local food in poetry. I got to know the Professor and his wife Eileen well, sitting around their kitchen table as he helped me with a language I had nearly forgotten and could not write, a language that I have become to love, the language of my birthplace. 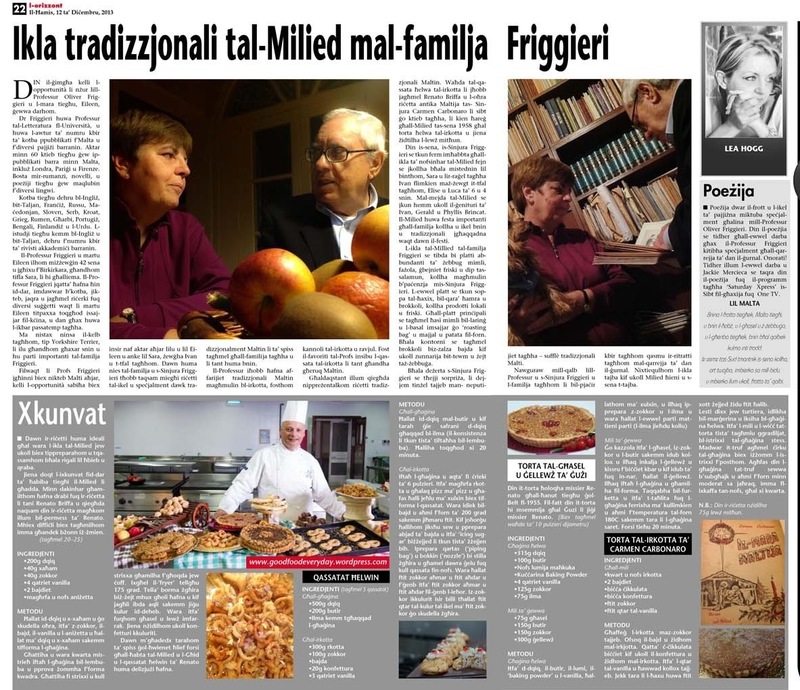 The Professor’s words of encouragement gave me the motivation and confidence to write a weekly food page in the local Press, which I do with great pride, something I look forward to from week to week. Eileen is always very hospitable. We sit around the kitchen table and we chat about all sorts of practical things like cooking and shopping. The Professor is a deep thinker and I am in awe of his reasoning and intelligence. He is so humble and modest. I am offered endless cups of tea to share and cold drinks in the summer, the door is always open and I am made to feel very welcome. There have been times when Eileen prepares sandwiches especially for me and little bites and snacks. 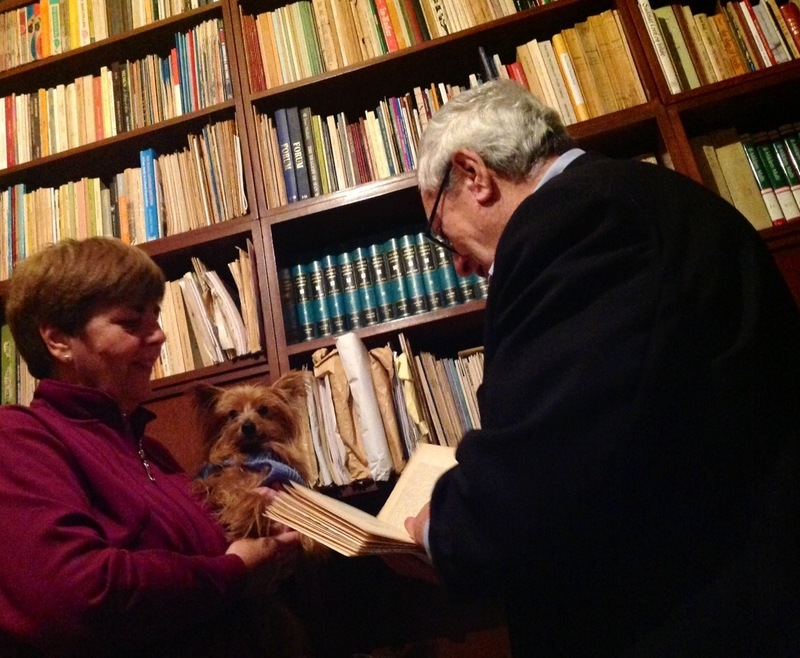 And Sparky, the Yorkshire Terrier, a bit viscious I am told, senses my ease with dogs and accepts me on my first visit. The Professor’s daughter Sara comes to visit with her two children sometimes, lively children excited to be with the grandparents as we listen to the Professor’s anecdotes. It is a strong family unit and not long ago I took photos of the Professor and Eileen for a feature in the Press. I am publishing them here during Valentine’s week together with a translation of the poem and as you read it you will be able to feel the Professor’s deep love for his country and his appreciation for the providence of the land. And for some time, i have wanted to create something simple yet contemporary using the food in the Professor’s poem. I was pleased with the result of the Roasted Grape Bread this week. 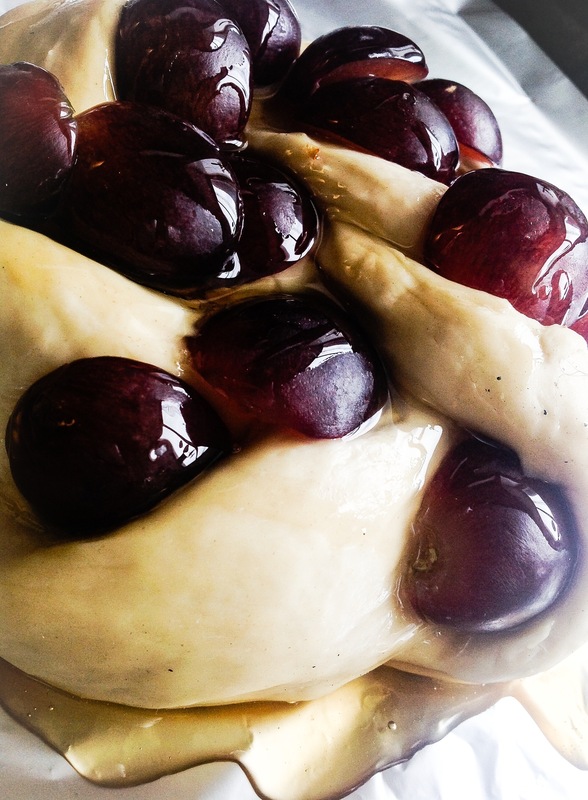 Fleshy grapes are kneaded into a dough which I made with virgin olive oil and carob honey from this winter’s harvest. 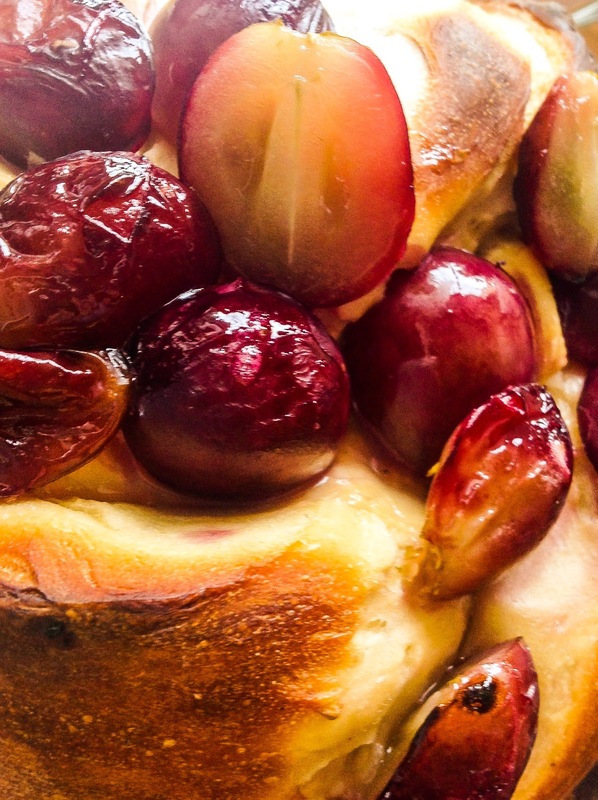 It is tied into a large knotted loaf, topped with more grapes and drizzled again with honey before it is baked. The bread is brushed with a choice of plain honey or a thickened syrup of honey brought to boil with the juice extracted from the grapes, depending on your preference. This I think is an ideal choice with a cheese plate, it is delicious and we had ours with goats cheese and peppered cheeselets made on the island… . 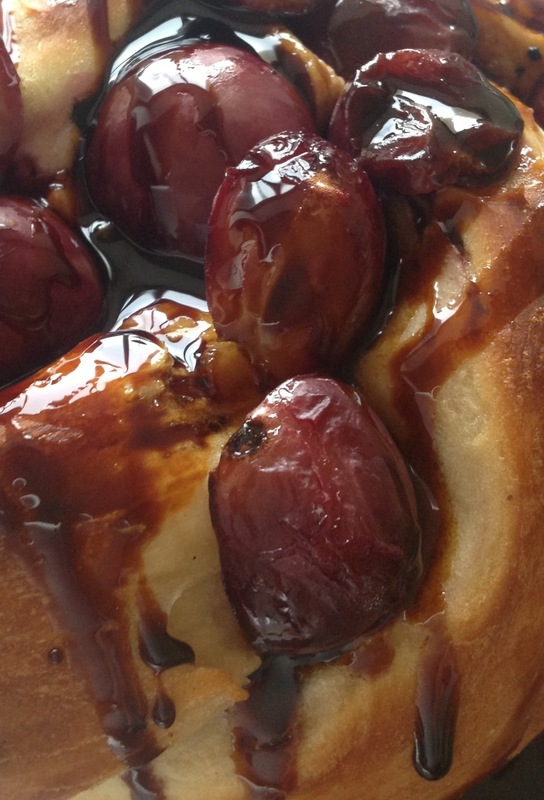 And the roasted grapes….. well the taste is something else… when the bread is hot, they are plump, filled with a concentrated juice that nearly tastes of jam. If you serve the bread when it cools, they become moist giant raisins. Totally divine…. perhaps you will take the time to try and make the Professor’s bread and read poetry to your loved this week with a toast to St Valentine and a glass of wine of course ! and equally blessed today, fruit of my heart. In large bowl, mix warm water and yeast. Add milk, honey, salt, and olive oil and mix well. Add 4 cups of flour and work in. Add in some of the remaining flour to make a dough. Turn dough out onto lightly floured surface and knead for 10 minutes working in the chopped grapes. Add more flour as needed until the dough is firm and smooth to the touch. Place the dough in oiled bowl. Cover with clean cloth and let rise in warm place for 1 hour. the dough into 2 parts. Shape each dough into a sausage. Twist the two pieces of dough into a rope and then knot. Cover and let rise in warm place until it doubles in size. Brush the bread all over with warm honey, top with the halved grapes and drizzle more honey. Bake at 220C F for 35 to 49 minutes or until bread top is golden brown. While still hot brush with warmed up honey or a syrup made of one part honey to two parts strained grape juice, no skin, no seeds and brought to a boil. Leave at a steady boil for 5 minutes and remove from heat. ← Quick weekday meal.. if you are in a hurry, a very simple eggplant bake ! Thank you ! Have a wonderful day ! Thank you Sophie, nice to see you again, so appreciate your opinion and delighted you like it ! Thank you ! 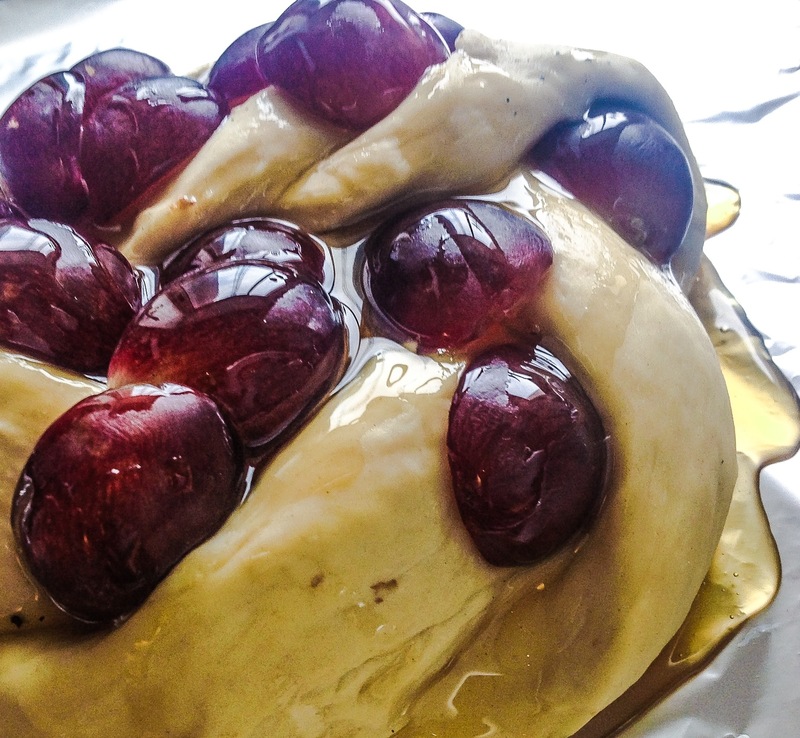 If you make Roasted Grape Bread, let me know what you think ! Wow, the more I read your articles, the more I do believe you are in the Island of Love! Roasted grape bead! How lovely it must be. Yes an island of love it is, a wonderful place to be ! So appreciate hearing from you ! Thank you so much for linking my blog ! So appreciate ! Thank you so much for linking my recipe ! Good grief, Lea – this looks like something the gods gave to man ! If ONLY I could make bread … but all I can produce is my small but totally delicious ¼tsp yeast stand overnight and bake in very hot oven loaf. That a great loaf of bread Margaret Rose! I am sure it was delicious !